NEW YORK -- It was a regular day at work for Angie Houtz. Sept 11, 2001 carried no special meaning. She was 27 years old, working as a civilian intelligence analyst in the Pentagon when the plane hit, killing her and 183 others. She was also my cousin; and now September 11th is a day I will always think of her. The 9/11 Memorial in lower Manhattan opened to the public at 6 p.m. Thursday, the 13th anniversary of the attacks. 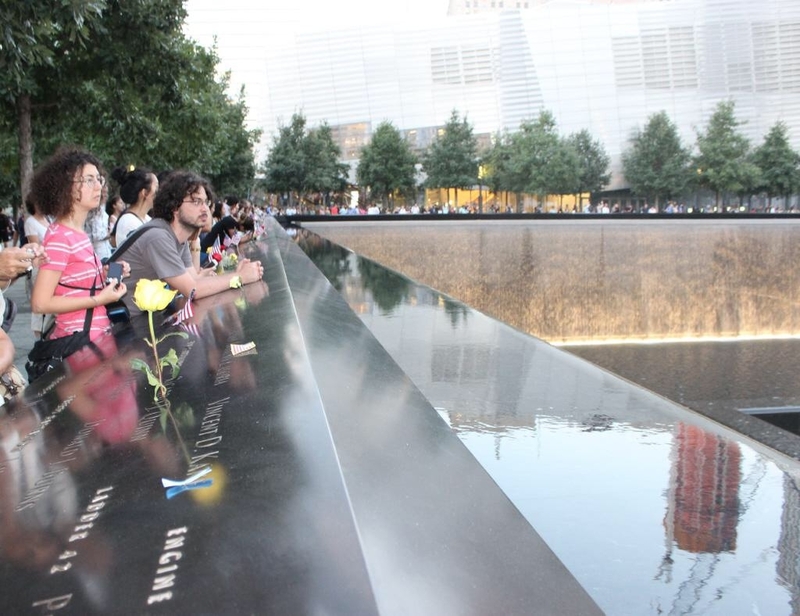 People of all ages and ethnicity gather around the two twin reflecting pools that are placed in the exact location the twin towers once stood. Standing almost shoulder to shoulder, a border is created of lives connected by one day. The contrast was stark between the ever moving city around us and the still contemplation of the memorial. As I circle the edges of the square pool, watching the water fall into the ground below, almost every emotion permeates the air. Smiles seen on the faces of loved ones reminiscing about the good times spent with those lost; tears shed in honor of the memories that will no longer be shared; and peace seen in the eyes of those that use this time to say goodbye. The water, powerfully ominous, seems to cleanse and heal the scars left behind. From a security guard: "13 years ago I had no idea I would be working here and everyday is a new experience; but today especially. It's very nice that everyone could come together. No one knows each other, but everyone comes together. It's beautiful." One volunteer, Iris, who said she was a first responder to the World Trade attacks, describes the attack: "That day was horrible. It felt like a war zone. Most people don't want to come down here. They say, 'I don't want to relive that day. I'm going to cry and be sad.' But that shouldn't stop them. If anything, that's a reason to come. It's a part of history that people need to remember." The sun is slow to set as many wait for the Tribute in Lights to begin. The tribute is an art installation comprised of 88 searchlights that create two vertical columns of white light in honor of the two fallen towers. Phones and cameras act as the eyes through which most people view the lights, anxious to both capture this moment and remember the moments lost 13 years ago. Through the confusion and pain, a sense of pride fills the air, as we know that even when darkness falls, our hope and strength will shine brighter and stronger than ever.